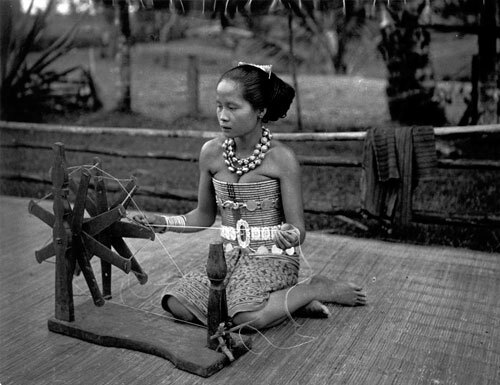 Jewelry from insular southeast Asia is as diverse and exotic as the many islands found therein. Artifacts date back to the Neolithic and Bronze Ages and styles were subsequently influenced by trade with China, India, and Europe. Within the region are numerous indigenous groups, many of which created jewelry for everyday and ceremonial use. Because of the great diversity of material found throughout these vast archipelagos, no single collection can be truly comprehensive and The East Indies Museum collection is no exception. However, we do feature a sizable array of examples including some early Dongson bronze jewelry, ancient Buddhist and Hindu gold, royal pieces from the courts of Jogjakarta and Surakarta, gold and diamond jewelry from Sumatra, Straits Chinese pieces, and a limited number of examples from the islands east of Bali.